ACORN members rallied in Ottawa, Peel, Toronto and Hamilton to oppose recent cuts to OW/ODSP and respond to the government's 100-day review of social assistance. Despite reiterating that the government was focused on taking a compassionate approach, the outcome of Social Services Minister Lisa Macleod's review has left many low-income Ontarians fearing the worst. On top of the 1.5% cut to social assistance that was announced in July, the government intends to redefine disability, which will likely make it more difficult to qualify for ODSP in future. Although we are glad that existing recipients will be grandfathered in, we are deeply concerned about that the new definition will mean that people with disabilities or mental health issues who may find it harder to qualify for social assistance. Although the Liberals’ plan for a $6,000 annual exemption for people working while receiving ODSP has been maintained, the clawback rate has been increased to 75%. People with disabilities who earn over $6,000 from employment will only receive 25 cents for every dollar they earn. We are also disappointed that the exemption has been cut from $400/month for OW recipients, to $300/month. This cut will further entrench poverty in our communities. Since they took office, we have frequently heard the government's divisive rhetoric that social assistance recipients just need to get a job. ACORN’s recent report reveals the impact of the UK’s punitive welfare system, where reforms have centered around cuts and work requirements. We don’t want Ontario to go the same way as the UK, where people are dying as a result of cuts. Unfortunately, today’s announcement marked a step in that direction, as the government indicated that they will be rewarding Employment Ontario staff for cutting off benefits. Other red flags include increasingly digitized services, which make it more difficult for low-income people and people with disabilities who do not have internet access to apply for benefits, and individual action plans, where recipients will likely be forced to track their every move or risk having their benefits stopped. Slashing social assistance, scrapping rent controls, rolling back minimum wage, cancelling funding for social housing retrofits, while cutting taxes for the most wealthy. This government might be waging a war on low-income Ontarians, but ACORN members are fighting back. Twenty six ACORN members rallied outside of the local ODSP/OW office to protest changes to social assistance that will make it harder for people to qualify for the program in addition to other dangerous reforms. ACORN members handed out flyers encouraging people to call their local MPP and to sign ACORN's petition to fight back. ACORN members from Mississauga Centre visited their Conservative MPP Natalia Kusendova. Our message to Ford and his MPPs: Making it harder for disabled people to receive ODSP benefits is unacceptable! The staff let us in and say they will check whether MPP Kusendova will meet with us, as requested. ACORN leaders returned to MPP Donna Skelly's office. Her staff accepted our letter and said they would get back to us regarding a meeting. Afterwards, we headed to Binbrook to talk to MPP Skelly's constituents about the government's cuts to social assistance. 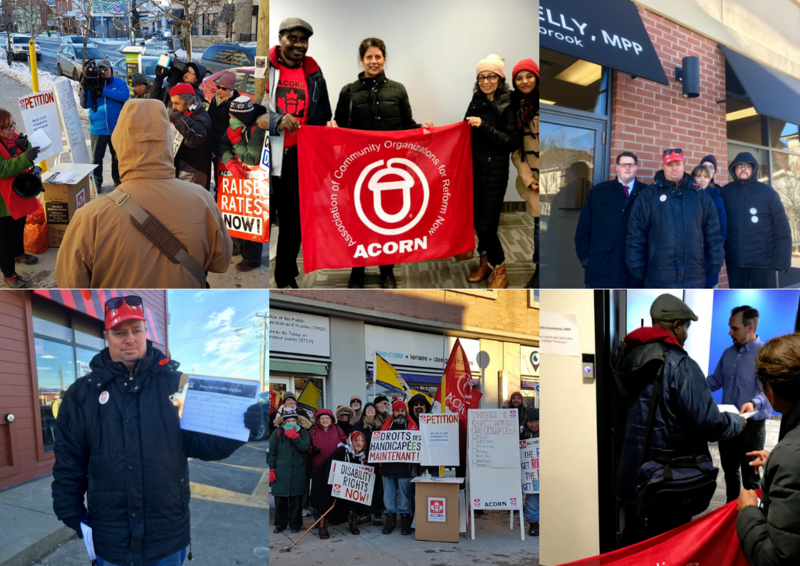 ACORN members from across the city went to MPP Robin Martin's office. Her staff accepted a letter and said they would get back about meeting with ACORN. Peter D'Gama, Etobicoke ACORN Co-Chair, explained in detail ACORN members' concerns regarding changes to social assistance and the suffering that changes made in the UK have caused to low and moderate income people.